We had 1 player get so fixated with trying to reach Hong Kong that he kinda threw his own game and as a result, got last. Everyone agreed that the artwork is gorgeous and there are pictures on BGG showing the entire artwork when you lay the exploration cards side by side. In summary, this is a light weight game with some interesting choices to be made. So far i think it plays well with 3 and 4. Not sure how it will work with 2. I won't own a copy but I won't say no to playing. Same emotions when compared to Augustus. Its heavier than Augustus by the way. 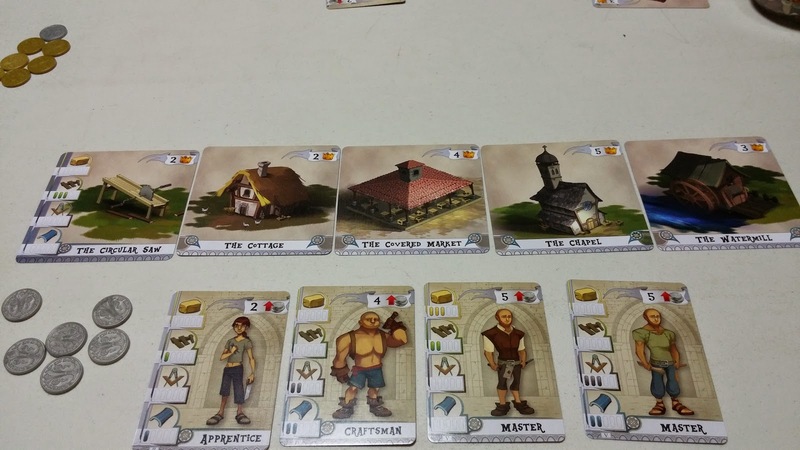 Next up was The Builders: Middle Ages. Now I have heard this being compared to Splendor so I was eager to see how it matches up. Small metal box with good art, this is a race game where players are trying to be the first to reach 17 points (from completed buildings/tools) will win the game. This is similar to Splendor and players are trying to build up an engine that is fast and efficient enough to grab them the 17 points to win. You do this by ensuring you have enough money and hiring the right combination of workers so that when you set them to work, you pay the minimum amount of money to get the building constructed which will provide you with the points and more money. Players can also build tools which often net you minimal points and no money BUT can be used to help construct buildings as well. Players do all this with only 3 actions per turn but are allowed to purchase more actions at 5 coins each. So as you can see, having enough money to do everything you want is essential. In Splendor though, you are trying to get the right amount of resource chips, fulfilling cards that grant you further resources so as to meet the requirements for better cards that grant you the actual points. In our game, same player that was trying to reach Hong Kong started grabbing as many tools as he can while the rest of us went by the more normal route. Grab 1 or 2 tools, get the right workers and started building. My engine was mostly running and I would have won by the next round with only 4 workers but another friend was faster and won the game. Player with all the tools did not get his tools up in time to make a difference. While Splendor and Builders have similar concepts, the executions are quite different. They may feel the same but they are definitely different games. I feel there is room enough for both. I will need to play more of The Builders to see if one can replace the other but for now I will definitely want to play more of both. The Builders seems more thematic for me though so I am more inclined to it for now. 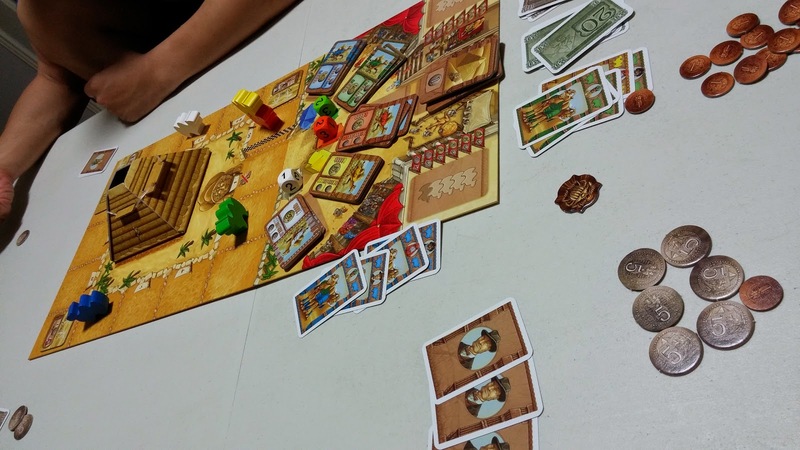 This gaming group did not have a chance to try Camel Up which has won the Spiel des Jahres 2014 award and since my colleague got a copy, I managed to borrow it and table it. Again another race game which plays up to 8, once a camel crosses the finish line the game ends. Player with the most coins will win the game. We had a very clear last camel (Blue) halfway thru the game so that was easy points for us. The winning camel though was not too clear until the very end. The group had a lot of fun playing with the Pyramid dicetower and in the end, the player who guessed both winning and losing camels accurately and earliest won the game. I will try this again this friday with my cousins and with 8 to see how it plays. Jonathan has mentioned he did and it still plays fine. I am not too hot about this though because its quite light and very party like for me. So while I won't say no to playing it, I won't go and buy myself a copy. All those dice and you cannot roll ANY of them! Next up is Unita from Helvetia games. Hevetia games have been producing some odd games recently and most of them seem to not be grabbing much attention so I was interested to give this a go. Unita is an abstract style game where players have units (represented by big chunky dice) and are trying to survive this maze and send the units to a portal at the center which will bring these units home. The game ends when all players have their units back home and the winner is the player who has the most pips from his/her dice. 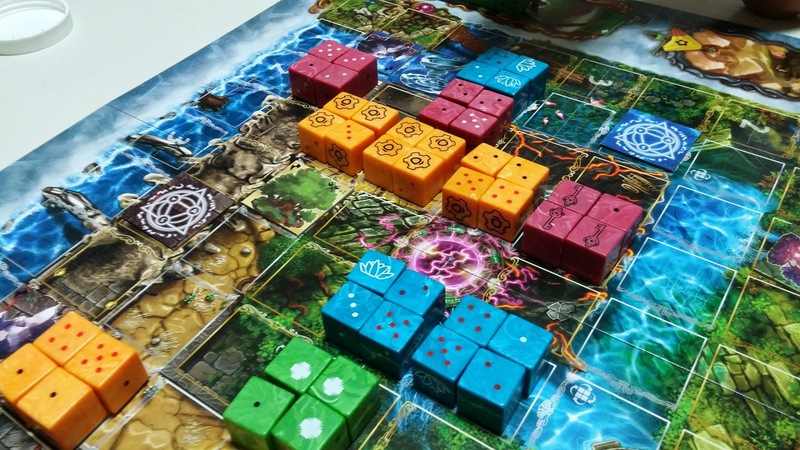 As players navigate the maze with their dice packs (dice travel in groups of 4), they will encounter 2 other players and battles will occur with the pips determining the strength in battle. If you lose a battle, then you will reduce the die's pips by 1 and trigger a change in ranks (the 2 dice that have fought will be switched with the other 2 dice). There are also cards which players can choose 1 out of 3 to use in the entire game and each player will have different cards to choose from. There are also 3 special terrain tiles which will take up more movement points (each player has 3 movement points per turn) when moving onto them and will award special bonuses when battles are conducted on them. At the start, we weren't all too sure what was happening and placed our dice to form 4 groups of 4 dice each. This setup however is very important as we found out later because it will determine the results of your first few battles. There are spaces in the maze where you can freely reorganize the dice in a group but those can only be reached after your armies have travelled and most likely battled for a few turns. As the game progressed, we realized just how much interaction we will have with 2 of our opponents. You will only ever interact with the same 2 opponents the entire game so how well you succeed in preserving your units and win will determine by how well each of us guard our designated enemies. There is a lot of interaction because of how the maze is designed as those with stronger armies can park them at strategic intersections and await your opponents to come to you. As we near the center where the portal is, it gets even tighter and a lot more thinking is involved. Potentially you can plan quite a fair bit from the start but your plans will usually change depending on what the other players do. Even losing all your pips on a die does not mean the die is ineffective. Instead, it now acts like a guard as it can protect the die behind it from defeat in battle. So some very interesting decisions to be made. Do you want to move forward now or concentrate on 1 group and leave the other for later? Or do you want your army to progress slowly but steadily together ? There are a few quirks to the game though that we felt we should house rule in the future. The cards are not very useful in our opinion as you can only choose 1 and some of them are 1 time use. The terrain special abilities felt odd as well. Though I can understand the purpose as they add another level of thinking when moving your army groups but the powers they provide is weak and does not help with the game play. The board is also very busy with all that fancy art but the dice are all so plain and chunky. In summary, it was an interesting game and definitely a lot of interaction. It just feels a little unpolished in some aspects. I will definitely want to try this again (perhaps I will try a rush the next time) but I am not sure about its longevity. 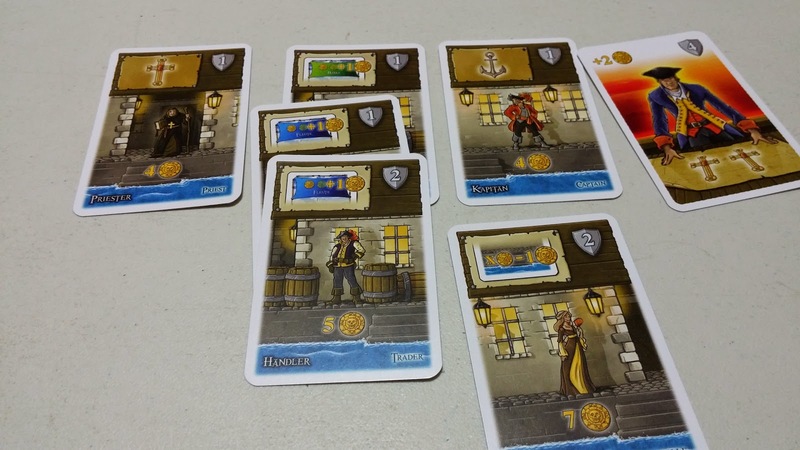 Port Royal is another race-style game we played that night (or early morning by now) but this is not new to me. I realized this time though how powerful the cards that award you +2 when you have 5 cards in the port and the Jester (+1 when 0 cards in the port) is but they also determine the strategy for the players as now players will definitely push their luck to at least 5 cards before deciding to stop. The last game though was very luck based at the end because if I drew someone I could hire, I would have been able to complete the mission and win. 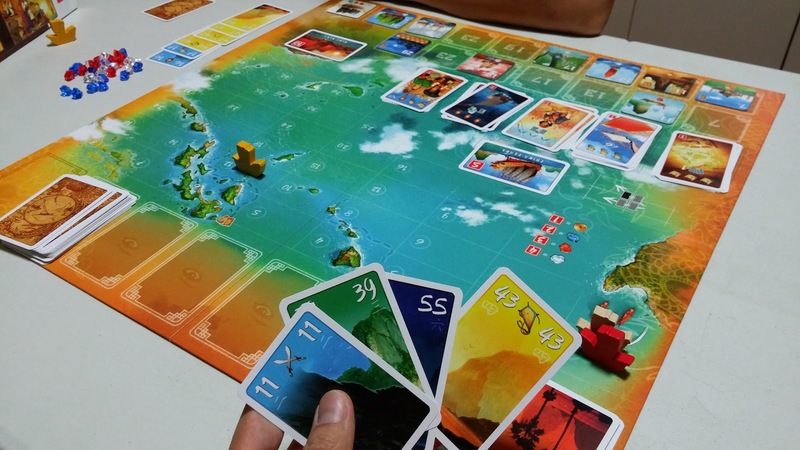 There were also instances where players' 2nd card was the same colored pirate ship and in a way they lost a turn. So the luck of the draw can rear its ugly head in this game. I will try this again but I won't get myself a copy. 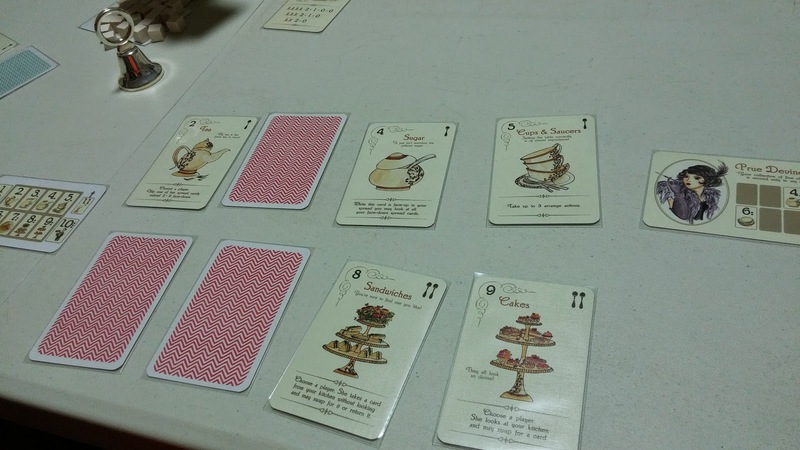 ﻿Final game of the night/morning was Elevenses, a kickstarter that delivered. A small sized game (all cards, some white "sugar" cubes and a bell), Elevenses is based on the theme of High Tea. Players have a tableau of 8 cards faced down in front of them with 3 cards in their hand. During their turn, they are allowed to play a card from their hand or perform 2 arrangements. The tableau is special because if you play a card, you are only allowed to play a card into that slot provided the card has the correct number (2-5 on the top row, 6-9 on the bottom) and that card is currently not faced up. Each card has specific actions that are executed when the card is played. The round ends when a player plays the Card number 11 but must have at least 4 cards faced up in his tableau. Players then count the number of spoons in their tableau and whoever has the most spoons will get a number of sugar cubes (depending on the number of players). First to reach 5 (or 7 or 9) points will win the game. The art is great and very fitting with the theme. Gameplay wise there is a lot of interaction in this and I often find myself wondering if I should play the 11th card now to end the round or push my luck and try to play more cards so I can win more cubes. I feel that this will play better with 2 or 3 players instead of 4 because a lot more actions can occur with 4 (as there are actions which force you to pass a card to the left or to the right). Something that I will want to try again and possibly get because my wife and I do enjoy high teas together. There is a solo variant on BGG as well that is Print and Play which I already did. I will post again on how it plays afterwards. RECOMMENDED! Thanks for your review of Elevenses - glad you liked it, thanks for playing! Unita I will definitely recommending you try it first before buying. Not everyone will enjoy it that's for sure!